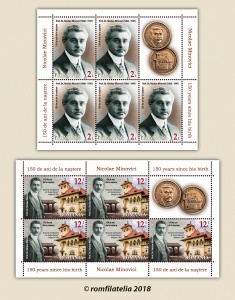 Romfilatelia dedicates the anniversary postage stamp issue Nicolae Minovici, 150 years since his birth to a remarkable personality of the Romanian medicine from the beginning of the 20th century, who had a significant contribution to the evolution of forensic medicine in Romania and was a passionate promoter of the Romanian traditions. 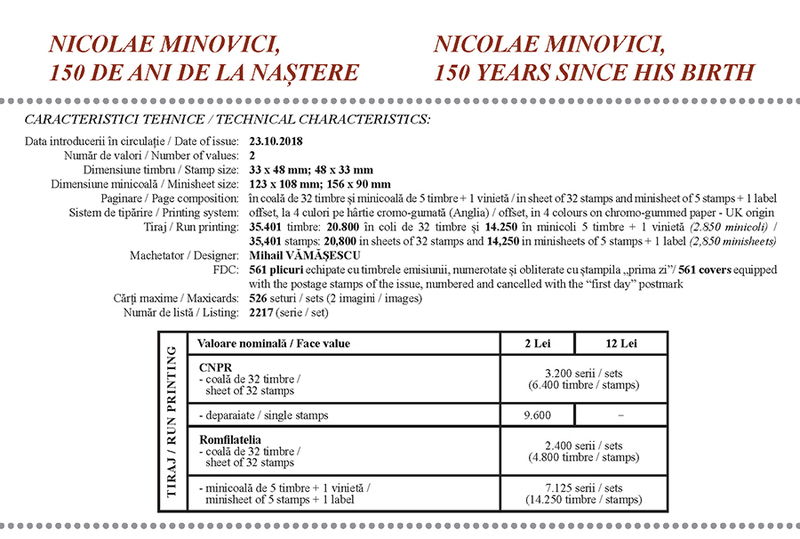 The first stamp of the issue, with the face value of Lei 2.00, illustrates the portrait of Prof. Dr. Nicolae Minovici and the second stamp of the issue, with the face value Lei 12.00, reproduce the image of the Villa with the bells, today the “Dr. Nicolae Minovici” Folk Art Museum, alongside another portrait of the founder of this institution. The Minovici family marked the history of Bucharest and not only through the involvement of its members in science, social life and culture, their achievements, ideas and foundations bringing significant changes to the Romanian society. Nicolae Minovici (1868-1941), the seventh child of the Stefan Minovici family, was compelling of sciences and art. He attended the primary school courses in Braila and in 1891, after he graduated from Sf. Sava High School of Bucharest, he enrolled to the School of Beaux-Arts, where he attended the courses for one year. At the insistence of this elder brother Mina, he goes back to exact sciences and enrolls to the Faculty of Medicine. Despite all that, Nicolae’s passion for art remains and defines him as a fervent collector of artifacts, mainly Romanian folk art objects. Between 1899 and 1901 he continued his studies in Berlin and worked at diverse institutions, where he met numerous personalities in the field of medicine. In 1902, Nicolae Minovici was appointed a forensic medical examiner attached to the Court of Ilfov and deputy director of the Forensic Medicine Institute, and also a forensic medicine professor at the State School of Sciences. In the same year he was asked by the City Hall to solve the issue of beggarliness and vagrancy in Bucharest. The setting up of the first Ambulance Society in the Balkans, in 1906, which was maintained from his own income for more than 30 years, marked another premiere. The company was operating in an old building situated on Dambovita pier, in the region of today’s Izvor Park. Of his entire activity we would like to also mention the following: in 1909 he was lecturer at the Forensic Medicine Department; in 1915 he was appointed as associate professor in Forensic Medicine and lecturer for this subject at the Faculty of Medicine; in 1919 he worked at the University of Cluj at the Forensic Medicine Department, where he set up the Forensic Medicine Institute; from 1936 he was the president of the Medical College of Ilfov, and as of 1938 he was president of the National Medical College. In 1926, he took over the position of mayor of the 3rd Blue District of Bucharest, comprising the quarters Rahova, Grozavesti, Mandravela, Dealul Spirii, Cotroceni, 13 Septembrie and Serban Voda. This part of the city, characterized by insanitary and crowded huts surrounded by piles of garbage registered many achievements during his mandate such as paved streets, vacant grounds turned into parks, the construction of the first underground toilets of Bucharest as well as of the first hostel for the district garbage men. His medical activity was completed by his passion for art. Thus, in 1904 he launched the project for the erection of the “first house in pure Romanian folk style” at the northern barrier of the city. The building made by his good friend, the architect Cristofi Cerchez, is considered as one of the remarkable architectural monuments for the Neo-Romanian style. It had been built initially to become a rest house and to home the impressive national art patrimony, already collected by Nicolae Minovici, by the time of construction. The collection was enriched between 1919 and 1940 through successive acquisitions. The museum was inaugurated in 1906 and his patrimony is predominated by textile objects – such as shirts, peasant blouses, two-gore homespun skirts, head dresses, towels and peasant rugs –, ceramic objects, representative collections of icons, painted eggs and wood objects specific to the autochthonous peasant household. Minovici donated his collection, together with the afferent property in total surface of 1.38 ha, to the Commune of Bucharest, while the villa was going to be “forever” a national art museum under the name of “Dr. Nicolae Minovici” National Art Museum. Although sick, Nicolae Minovici continued to live his life in pains until June 26th, 1941 when he passed. Romfilatelia thanks the Bucharest Municipality Museum for the documentary and photographic support granted for the achievement of this postage stamp issue.